Manx rider Dan Kneen has completed a one-year deal with Ballymoney team Millsport Racing to contest the international road races in 2015. As revealed in the News Letter last week, the 27-year-old from Braddan will ride a full stable of Suzuki machinery for Jimmy Murray’s outfit next season, contesting the North West 200, Isle of Man TT and Ulster Grand Prix, plus selected National meetings and the Adelaide Masters short circuit series. Kneen, who enjoyed a hugely successful campaign this year in John Burrows’ B.E. Racing squad, joins an illustrious list of names who have competed under the JMF Millsport banner in the past, including Martin Finnegan, Alastair Seeley, Keith Amor, Lee Johnston, Michael Rutter and Ryan Farquhar. The Isle of Man prospect dominated the Irish National scene this season, clinching the Irish and Ulster Superbike titles and finishing with a flourish at the Ulster Grand Prix, where Kneen earned his maiden international success in the Superstock race. He was caught up in Dean Harrison’s crash in the Supersport event at Dundrod, sustaining injuries to his foot that have ruled him out of next weekend’s Macau Grand Prix, but Kneen will be fighting fit for 2015 as Murray’s Millsport team returns to the roads following a spell in the British Superstock and Superbike classes with Ducati. “Once I found out Millsport were going to have a direct Suzuki connection, I knew it would be the right move for me,” said Kneen. “I’m also looking forward to racing in the Adelaide Masters’ Series on a Millsport Suzuki, as I enjoy the circuits as much as the roads and it will give me valuable track time on the team’s new bikes. Millsport will manage a new Suzuki dealership at its Ballymoney premises and will supply Kneen with GSX-R Superstock, Supersport and Superbike machines, operating under the name Millsport Suzuki. Team owner Murray said that while Kneen’s deal was initially a one-year contract, he hoped it could be the start of a longer partnership with the Manx rider. “Dan’s a nice lad and having spoken to a number of riders he’s the one we believed would fit in best at Millsport Suzuki. Our goal is to enjoy our season and be as competitive as possible, with the main focus being the North West 200, Isle of Man TT and Ulster Grand Prix,” said Murray. Murray’s son Patrick, Millsport Suzuki’s team principal, said he believes Kneen has the potential to score his first victory at the Isle of Man TT with the team over the next few years. 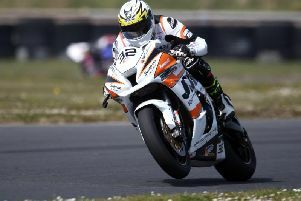 “Dan is a young and very capable road racer, and he proved this season that he can mix it with the very best,” he said. Kneen’s departure from former team B.E. Racing was confirmed on Monday and Dungannon man Burrows is now weighing up his options for next year.